Unfortunately, the Mercury Hermes Scooter was a total disaster. Although Mercury tried introducing several more models over the next 3 years in a desperate attempt to recoup losses, by 1958 the company went into liquidation. 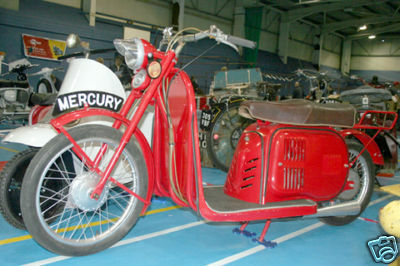 With such limited production, examples of the Mercury motorcycle, moped or scooters are now very hard to find. A Very Rare Scooter in Original Unrestored Condition. In 1956, when the Hermes was launched, times were changing fast and new-fangled things called 'mo-peds' had just arrived; old-fashioned cyclemotors and autocycles were no longer wanted. Youngsters now rode scooters, went off on jaunts with them, joined clubs, had camping holidays, on the ferry to France. Even moped manufacturers had to start making them look a bit more like scooters - hence the 'scooterette' design of this one. 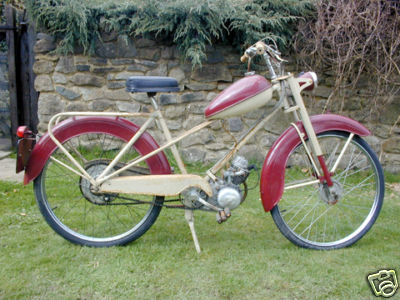 The Mercette is one of the rarest British cyclemotors, and this example - believed one of only four to have survived - is in excellent all-round condition.